Ok, so far I have looked at other artists illustrations of squirrels, discovered roughly some key guidelines of what I want to achieve and so now I need start to crack out some work. I started off by looking back at the bullet points I had set myself for this weeks work and one of them was to watch video footage of squirrels and draw from this type of medium. 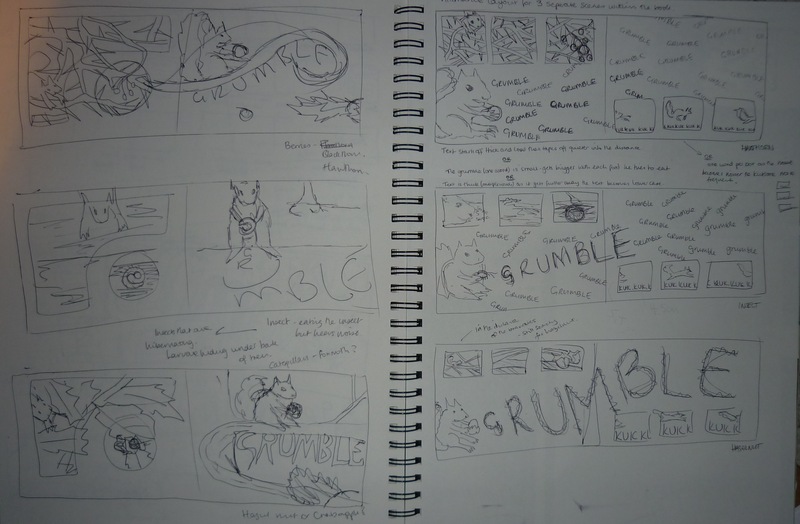 Here are a few of my sketches, sorry it’s not a very good photo, it couldn’t pick up the light pencil very well. I found this actually a very useful technique as I found that my drawings of the simple yet complicated facial shape of the squirrel were improving. The drawings I came out with had more fluidity to them and gave me more movement which I will use in my book. I don’t want to draw them and then think right thats done and revert back to set images because I want a sense of movement and realism in the book. Also, just watching these creatures are amazing, they are so agile and they are confident in their moves and jumps across large areas of land and height. From quick sketches to detailed drawings, I thought I would attempt to use the same materials and techniques I did with the Jay with the squirrel. I took a photo and sketched out the basic guideline, then using pastel pencils with water I painted the base colours of the image and then used the pastel pencils again, once the paper was dry, to build up the layers of hair and tone. I am pleased with the outcome especially how I’ve tried to create the flow of movement in the hair. A closer view of the layers of lines creating the illusion of hair. I love illustrating the tail as it’s more complex than meets the eye, as there are many colours within the tail and there tends to be layers of colour, for example on the tips or edge of the tail there is a layer of dark brown/black and the rest is white, all the way to the end. This was difficult to incorporate as the white doesn’t really show up. From a tutorial it was suggested I could use masking fluid which I could then rub away revealing the white paper, but the problem with that is I could cause the pastel to smudge and due to this hair being so fine it may be a little tricky. 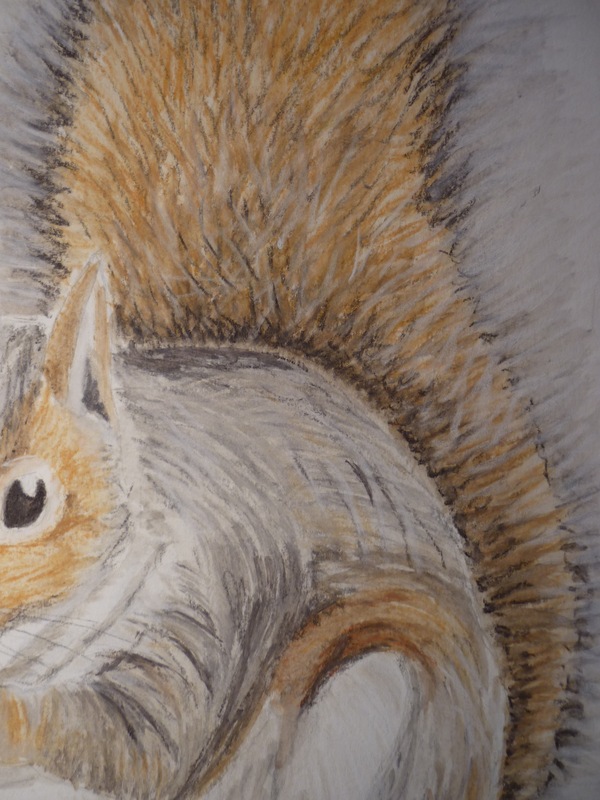 I will have to combat this problem when I start creating the backgrounds to my scenes as the tail is an important part of the the visual identity of the squirrel and I want the white to show. The beginning of the sketching process, my favourite part I must admit is trying to think of new exciting ways to show the full potential of a moment or scene in a book. Creating unusual angles or highlighting key areas of interest is an important part and there’s no restrictions of the imagination and there is no right or wrong at this stage as a ‘bad’ idea could lead onto the final piece. Whilst researching into what a grey squirrel eats was trickier than I thought! 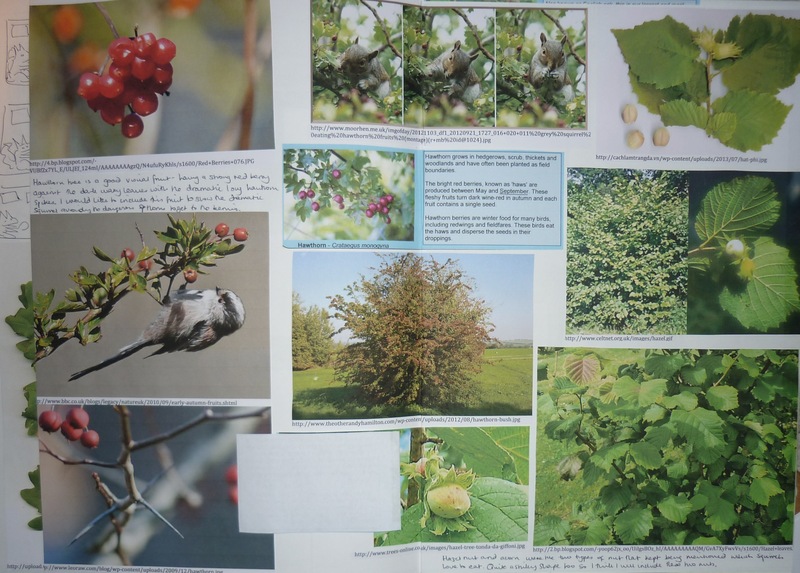 I thought there would be tonnes of information on the web, as they are a common animal and most people know what and where to find them yet the information I found was quite vague, for example I read many times they eat berries, fungi and sometimes insects but there wasn’t any specific details of the types of berries or fungi. I had to do some detective work and watch videos of squirrels eat and work out what it was, obviously there was the common food of hazelnuts and acorns but I wanted to find something lesser known. By researching into the squirrels diet I realised I wanted to base my book in September roughly, so the end of summer and beginnings of autumn. I chose these seasons as it means I can play around with the background scenes using warm colours, having a little green foliage alongside the beginnings of trees losing their leaves. I would think it is going to be a complex process but I like a challenge now and then!